In the two weeks since he raised his right hand and swore to preserve, protect, and defend the Constitution of the United States, Donald Trump has shut down the entire refugee program for 120 days; pledged that Christian refugees would be given priority when the program resumes; blocked visas to visitors from seven Muslim countries; granted immigration officials power to deny entry to green-card holders from those Muslim countries; promised to publish a weekly list of crimes committed by immigrants; redefined the category of “criminals subject to deportation” to include people whoICE considers a security risk even if they haven’t been charged or convicted of a crime; and threatened to withhold federal grant money from sanctuary cities if they don’t comply with his executive orders. All this is immoral. There is reason to believe that it is illegal as well. The Immigration and Nationality Act of 1965 abolished the use of national origins in immigration quotas, choosing instead to make skills and family relationships the primary criteria by which an applicant can be judged. Establishing a religious test for refugees runs counter to the values of a country founded on the idea of religious freedom. As for permanent residents, they’re entitled to the protections guaranteed by the Constitution. 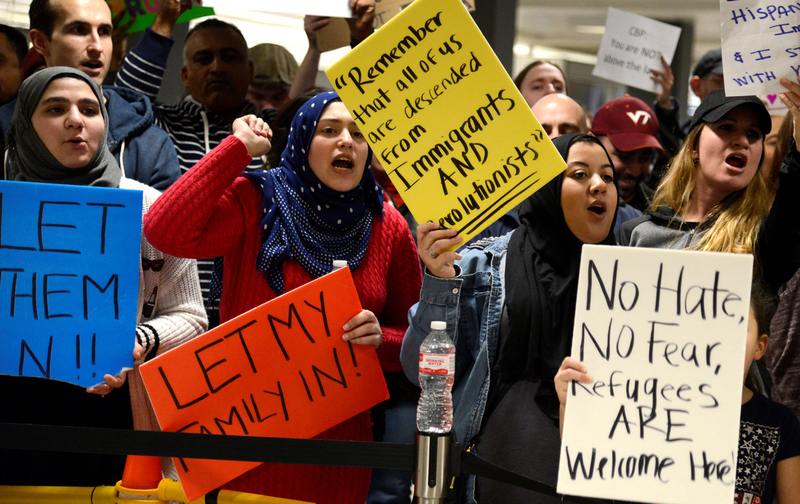 A federal judge in New York agrees: A day after the ban went into effect and Muslim travelers were detained at airports, she issued an emergency stay. Trump’s ban currently affects seven countries: Syria, Iraq, Iran, Somalia, Sudan, Libya, and Yemen. At least since 1975, not one fatal terrorist attack inside the United States has been committed by a national from these countries. In fact, with the exception of Iran, the United States has bombed every one of these countries. The administration’s position is clear: We will destroy your homes in our search for terrorists, and if you flee either the bombing or the terrorists, we will close our borders to you. This executive order does not improve the safety of Americans. Quite the opposite: It endangers Americans, because it serves as a recruiting tool for terrorists. I only said this to comfort her. The truth is that I am not at all confident that my US passport will protect me. Who is to say what other countries Trump might target next? Who is to say that the ban might not be expanded to naturalized citizens? Some of my friends tell me the president can’t do anything. It would be unconstitutional, they say. But we have known for many months that Trump’s businesses around the world pose conflicts of interest, which would put him in violation of the Emoluments Clause of the Constitution. He promised several times to resolve these conflicts, but he hasn’t. In addition, he reportedly continues to use an unsecured Android phone inside the White House, which puts him at risk of surveillance from foreign powers and violates the Presidential Records Acts. It’s nice to be able to appeal to the Constitution, but if our representatives have done nothing to enforce it so far, why should I believe that they’ll do something if Trump comes after people like me? The executive orders are not a surprise: They’re a fulfillment of promises he made during his campaign. Back then, when Trump was nothing more than a charismatic reality-television star, Mike Pence declared, “Calls to ban Muslims from entering the U.S. are offensive and unconstitutional.” Mitch McConnell said the ban was “completely and totally inconsistent with American values.” And Paul Ryan said, “A religious test for entering our country is not reflective of America’s fundamental values. I reject it.” Where are they now? For that matter, where are the Democrats? On the day of Trump’s inauguration, I flew with my family to Washington to take part in the women’s march. We wanted to take a stand against the president’s sexism and bigotry. Our message was Resist. But the message Senate Democrats seemed to have received was Enable. Many of them voted in favor of some—or even all—of Trump’s nominees. To be clear, Trump’s appointees will be confirmed anyhow by a Republican-controlled Senate. All Senate Democrats could do was take a stand. And they didn’t. Now, with protests starting at many international airports, several Democrats have issued statements against the ban (and a few have joined the protests). But we need more action, not just condemnation. Meanwhile, Trump froze all pending federal regulations, pledged to cut taxes “massively,” suspended government hiring, brought back the Keystone XL and Dakota Access pipelines, forbade the EPA and USDA from sharing information with the public, barred American aid from being given to groups that provide abortion overseas, repeated his lie that “millions” voted illegally and ordered an investigation into voter fraud, told Congress he plans to build a wall along the Mexico border at a cost of at least $15 billion, shut down the White House comment phone line, and sent out a press release filled with praiseful quotes about himself. We are living under a form of shock and awe. The goal of this administration is to overwhelm us with so many punitive orders, racist policies, outright fabrications, and silly controversies that we lose the spirit to fight. Many a morning since the election, I’ve woken up with the paralyzing fear of what the president might have done overnight, some new fight he might have picked with a nuclear power, a diplomatic agreement he might have abrogated, journalists or press organizations he might have attacked. I know I’m not alone. The worse the news gets, the more tempting it is to turn away from it. But what we’re facing is the rapid dismantling of political norms and the destruction of an open democracy. If Trump can do all this and face no opposition, he’ll do more. Silence will not protect you. If you think what is happening to Muslims will never happen to you, you’re mistaken. We will either survive together or perish separately.